World Wide Waftage - Wafting Through Our World Wide Travels with Ease, Joy and Simplicity: Antarctica - February 5, 2018...Pleneau...Check this out!...Amazing! Antarctica - February 5, 2018...Pleneau...Check this out!...Amazing! There we were, sitting on a Zodiac boat in Pleneau Bay sipping on French champagne. Was that ever fun! The excitement keeps coming and coming. This exquisite ship and its staff go over the top to make this an exceptional experience for all of its passengers, even when circumstances may not be ideal. All passengers, based on languages spoken are broken up into color groups, red, green, yellow with blue for us and many of our English speaking new friends. Tom taking a sip of champagne. When announcements are made the color groups are called, one at a time, to board the Zodiac boats. On Saturday morning, we were scheduled to board a Zodiac at 7:00 am. After a rough start to the morning, we decided to wait and go aboard at the end of all of the color groups. This proved to be a mistake. By coincidence, we ran into new friends Marg and Steve, who’d had the same idea. All 10 of us on the boat were handed champagne flutes while Chris filled our glasses. Within moments, the ship’s hotel manager Florent, approached us stating he was going to find a solution for the four of us to get out on the Zodiac for at least a 30-minute expedition of Paradise Bay, as opposed to the planned 75-minute tour. We insisted it wasn’t necessary. It was our fault we’d failed to get to board in a timely manner. We waited patiently in the Main Lounge on deck three, not expecting it would work out. Voila! Florent and Cruise Director William made it happen. They didn’t want us to miss this special outing on the Zodiac boat. Chris, a high ranking naturalist on board drove the Zodiac and hosted the toasting of the champagne. The champagne and flute carriers were loaded on to all of the Zodiac boats. 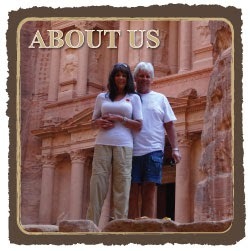 There have been out on no less than 15 landings and/or Zodiac excursions since the onset of the cruise. I missed one, early on, when it was a steep climb when my knee was at its worst. Instead, Tom went on his own and took excellent photos. We were told we'd stay away from most of the icebergs, many of which could collapse at any moment. As for all the remainder of the expeditions, we walked as much as I could, at times avoiding the highest and hardest climbs. The doctor has said I could walk but not climb. A mushroom-shaped iceberg was much bigger than it appears in the photo. We don’t feel as if we've missed a thing. We took thousands of photos, experiencing interesting and unusual sightings fulfilling all of our goals in visiting our seventh and final continent, the vast Antarctic and its many wonders. Our favorite bartender, Nick. He's quite a guy! A Crbcatcher Seal taking the plunge. As shown in today’s photos, we all had an unexpected special event of being served real French champagne aboard our Zodiac when we toured Pleneau, which is known as the “graveyard for icebergs”” where many icebergs end up in this region based on prevailing winds and tides. Crabcatcher Seals lounging on an iceberg. Tom doesn’t care for champagne so he passed his off to Marg who happened to be on this 10 passenger boat with us (along with her husband Steve). I wasn’t about to drink two flutes of champagne when it was still early in the day. Tom with his Antarctic sunburn. Neither of us cares to drink any alcoholic beverages during daylight hours, finding it makes us sleepy and out of sorts. We wanted to feel great to continue to enjoy every aspect of this spectacular cruise, one we’ll never forget and realistically one we’ll never make again. For us, coming to Antarctica is a once-in-a-lifetime experience. A passing Silver Cloud ship. We have so much more to share, including numerous whale sightings and a ship’s party on an ice floe! Please check back! Late 30's model Ford at an old car show in Geeveston, Tasmania. For more photos, please click here.